as seen from the viewpoint of one of the younger generation of farmers in the Redlake Valley. The following article from John Phillips should have been in this month’s edition of The Redlake, however we did not have room to put it all in and it needed to be seen and read. The Boys from the Blackstuff. 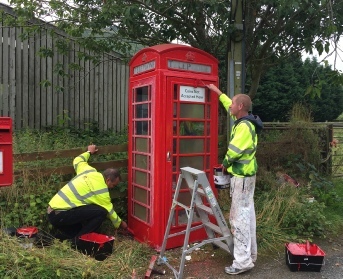 It was good of BT to finally get around to sending two likely lads from Liverpool down to paint our phone box. Only one problem, though; once the paint dried, the door was stuck fast! "Gissa job. I can do that." What a lovely evening we had last Saturday! Known now as ‘Food and Flicks’, it involves providing a meal for 50 people, then showing a film; we try to serve topical food relating to the film being shown. Saturday night we showed the latest Dad’s Army film and served food suitable for 1944 - Corned Beef Pie and Mutton Stew, which was delicious and some possibly authentic puddings with the modern addition of extra cream and real fresh eggs! The film was as funny as Dad’s Army should be, but I for one missed the old characters and felt they had let me down a bit! The only person who really was either as good or maybe even a bit better than the original, I thought was the character ‘Godfrey’ played by Michael Gambon. The others were all nearly right, but not quite ‘right’ enough. It was fun having the ladies introduced though and it was a good film! Well, Christmas has been and gone and Happy New Year to you all! 2016 was generally a good year for farming with relatively normal weather conditions, which allowed jobs to get done without being under any real pressure. Ewes are generally looking well apart from the odd few that always seem to drop off at this time of year. I have started giving my yearlings some corn every morning even though they do not start lambing until April. Past experience has taught me not to try and save money on feed, so the extra cost of feeding our young ewes a few weeks earlier is a few quid that I do not grudge spending. Now I could go on about my farming escapades over the last year and my hopes and plans for the next in this column, but I feel there is a massive topic that has come about in the farming world and the rural community that deserves priority - Brexit. On the 23rd June the UK voted to leave the EU, a morning I will certainly never forget and as time passes on I grow more apprehensive for the prospects of farming in the uplands especially as Theresa May has now stated that we will be leaving the single market and the Customs Union. Farmers should be under no illusion as to how big a deal this is for the future. I make no secret in the fact that I voted to stay in Europe and could not understand why any farmer wanted to come out. I suspect it was a case of sticking two fingers up to the EU with all their darn rules without thinking about farming subsidy arrangements and the massive market on our doorstep that Europe has provided to our benefit over the last 40 years. Remember a great deal of our beef and most of our lamb ends up across the water, as the consumption, particularly of lamb in our home market dies a slow death. Now I know the EU was far from perfect but with the back bone of the union being the Germans and the French we would always have received some form of direct support which whether you agree with or not, I believe is vital. It may be a slight contradiction but I see direct farming subsidies as a necessary evil and wish we could make a good living on what we sell off the farm, but in the real world I just can’t see that upland farming is profitable without it. It’s a complicated situation but I can’t imagine that people will suddenly agree to start paying twice as much for their food. With that in mind do you think the UK government will continue to support farming, bearing in mind it was the only country who has openly supported cuts to direct farm subsidies in all previous reforms of the common agricultural policy? Did it look after its primary industries in years gone by? Not at all and now we import most of our goods and have far too many people in suits when they used to be in boiler suits making things. Will the government worry about a few livestock farmers when it comes to negotiating trade deals or will we be down the queue? This all remains to be seen, but still it seemed that 70% of farmers were willing to gamble on this by voting out. All I know is, that after seeing some AHDB figures on consumer’ eating habits, red meat and particularly lamb needs all the help it can get in a dwindling market as consumers both at home and abroad switch to white meat. Maybe we can tap into some of those exciting new markets that everyone keeps going on about - what that really means is pitching our produce on the world market and we shouldn’t kid ourselves about the reality of how brutal that environment can be. I do think however the next 2/3 years will be profitable for farming as the exchange rate should remain in our favour as markets remain volatile with all the uncertainty from Brexit and the triggering of Article 50. This makes our produce cheaper to buy in the European markets as well as getting more pounds when our Subsidy is converted from euros. Being only 33 means I am probably not qualified to give out advice, but if I were, my message would be… take advantage in the advances of technology and breeding that is currently out there to maximise the full potential of your farm, invest in your farming infrastructure to become as efficient as you can be so whatever you sell has been raised to the point of sale with the minimum of cost without compromising on quality. However that may be is up to the individual to see fit. It’s as the outgoing chairman of McCartney’s, John Uffold says “fix the roof while the sun shines in these better times as there may be a storm coming round the corner”. Let’s hope it’s not the perfect one. Best wishes to you all John Phillips, Treverward. On a reasonably cool, but dry day, Chapel Lawn hosted a fabulous day of woodland entertainment, interest and all things related in their second Woodland Fair. My thanks to Clare and Dave Wright at The School House for these first photos. 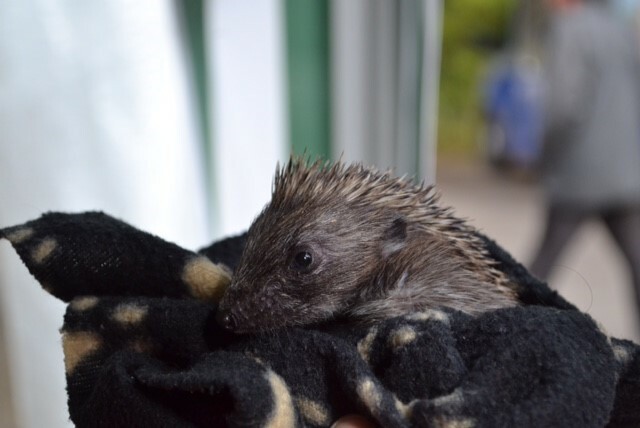 And thank you also to Patrick Cosgrove for the pictures in the photo gallery which you can reach by clicking the picture on the left. Roll your mouse over the small pictures with borders to see bigger versions. Chapel Lawn Woodland Fair, organised by the RVCBS and Chapel Lawn Village Hall, was a fantastic celebration not only of the wonderful trees and woodland of the Redlake Valley, but also rustic crafts past & present, engagingly presented to inspire everyone from the young to the more mature. This was a true community event with fantastic talented local artists exhibiting their paintings, photographs, jewellery, machine-sewn crafts and book art. 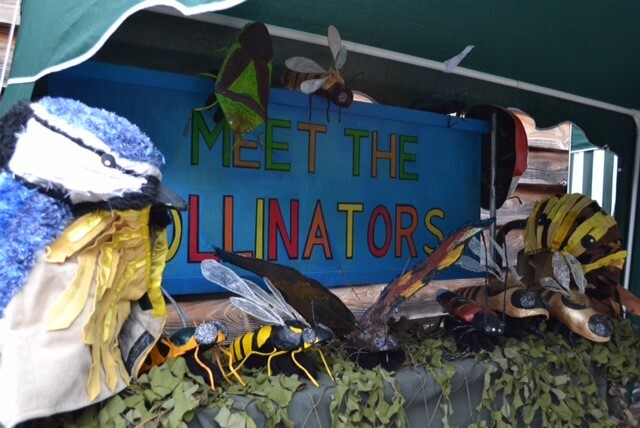 Arriving at the old school yard, visitors were immediately engaged by exhibitors sharing specialist knowledge encouraging preservation of local flora and fauna. 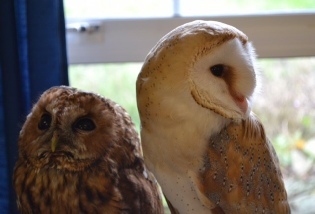 After having a go at tree identification and learning from the WI about planting that might encourage bees, in the meadow the Village Verges Project advised how to conserve natural flora, while the Owl Rescue offered opportunities to observe these amazing birds in close proximity. 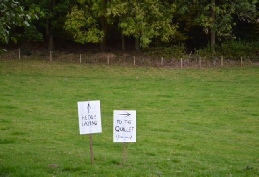 The quillet proved an ideal location to observe hedge-laying and learn about coppicing, with opportunities to be guided on a wild food foraging walk. For children, story-telling in the wood and woodland crafts were inspiring and face-painting added to the fun. The drumming workshops involved visitors of all ages in the quillet, while heavy horse demonstrations in the meadow gave proceedings an authentic rustic atmosphere. There were wonderful traditional crafts on display from amazing carved character walking sticks, traditional clogs, woven baskets and coracles, hand-made chairs and small chests of drawers carved from exotic woods. Skilled craftsmen happily shared their skills. In the church, decorated with skilfully arranged country-themed floral displays, a series of fascinating talks included: insight into the secret life of pine martens spotted in the locality, how tree ring-dating is carried out and a taster of an on-going local history research project. 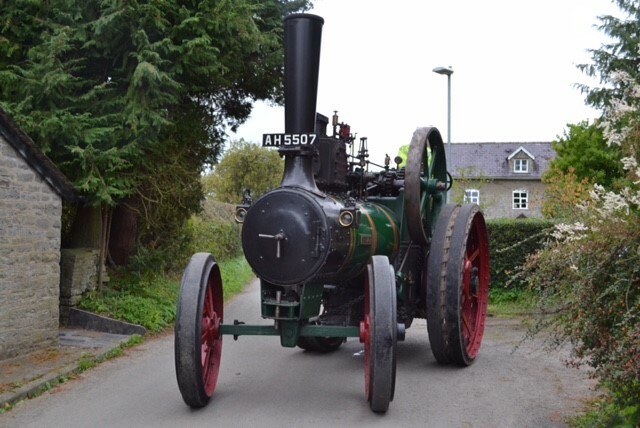 For those keen on heritage preservation, a traction engine steamed into the village and a vintage car arrived in the school yard. 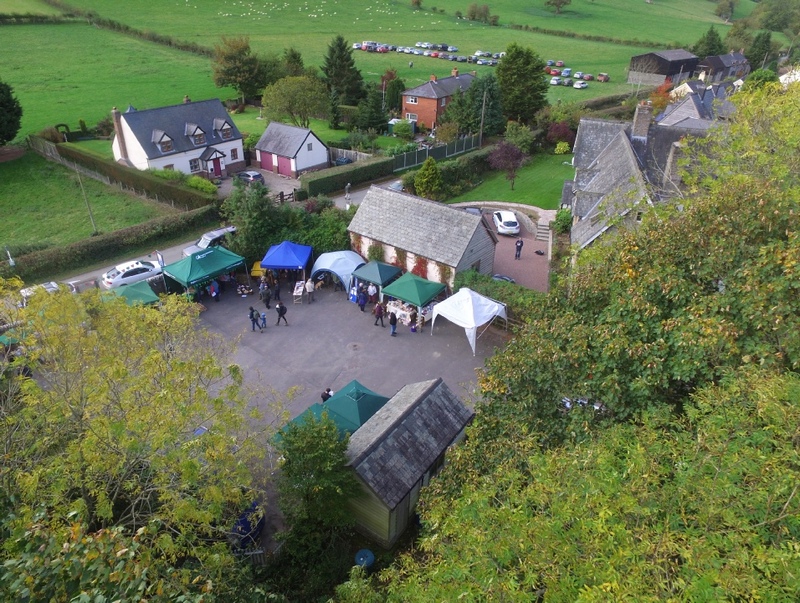 Throughout the day visitors sampled tasty refreshments, including hot baked potatoes and delicious cakes, which were readily available in the village hall. 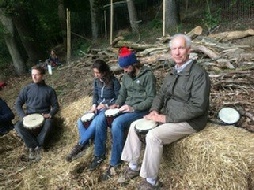 In the meadow, cob oven pizzas were prepared to order, accompanied by folk music from a ceilidh band. To conclude this immense celebration of Chapel Lawn's woodland and the locality, a film of Bucknell Woodyard in the 1960's gave an unique insight into rural life of that decade, while the evening talk referencing Caer Caradoc, whetted the appetite of those who were subsequently able to ascend to the Iron Age fort, to learn more of its unique history. Thank you Redlake Valley Community Benefit Society, Chapel Lawn Village Hall and church. As a visitor, it was a privilege to enjoy such a rich diversity of crafts and craftspeople in one locality, so thoughtfully planned and coordinated. 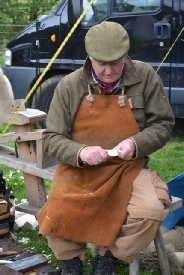 I can't wait for the next Woodland Fair, in a few years time and would highly recommend the event for anyone seeking knowledge of woodland conservation and crafts. 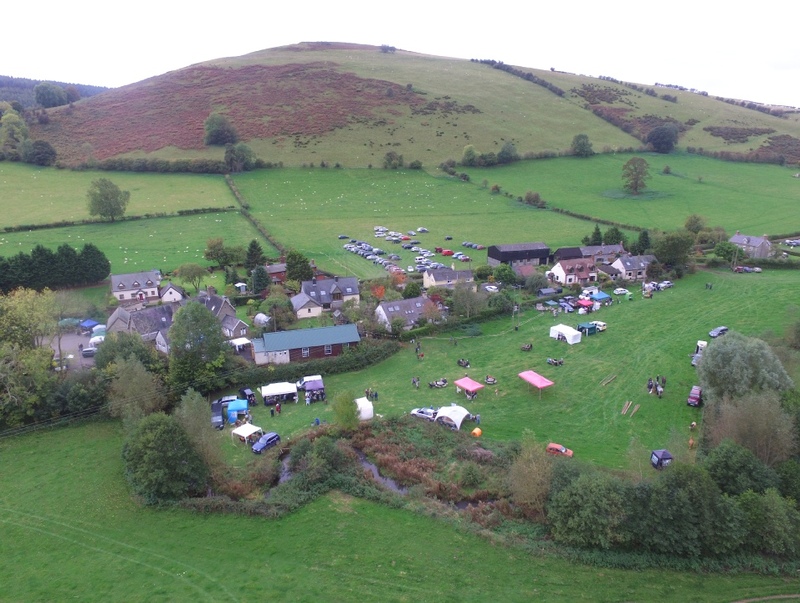 I so enjoyed this event, though I experienced much of it ‘second hand’ as I was on a stall for Knucklas Castle Community Land Project for most of the day, so heard about things from the descriptions of others. It is a wonderful site for such an event with its different spaces all next to each other and the woodlands rising up behind. Our stand was just outside the Village Hall, conveniently close to the teas and cakes and even closer to the really good ice cream. This was not the only very good food at the event– there were pizzas cooked in a clay oven. I did have to queue a while for this and I noticed another long clue for the burgers nearby, but both were well worth the wait. Anyway I had many good conversations with both friends and strangers while we waited and I became quite well informed about how to build a clay oven. 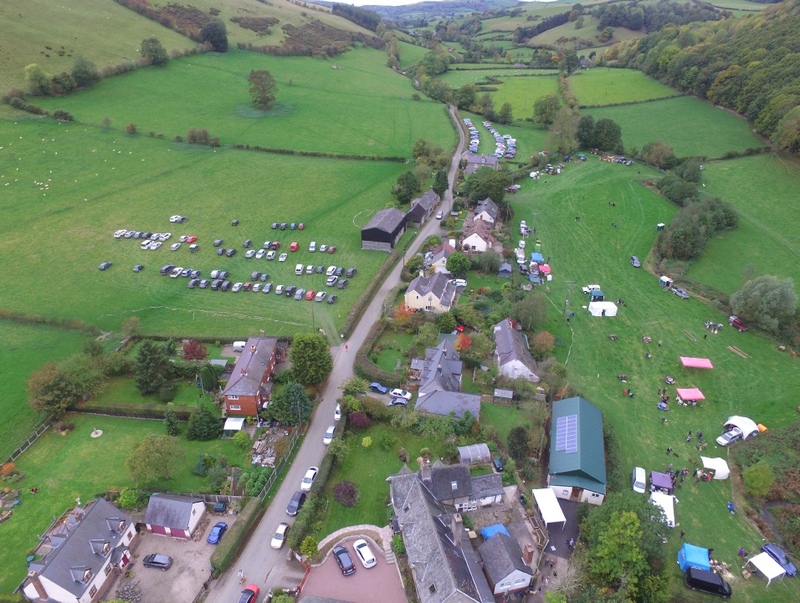 There were plenty of very interesting stalls from both commercial and voluntary organisations with a large variety of woodland and other products on show or for sale. 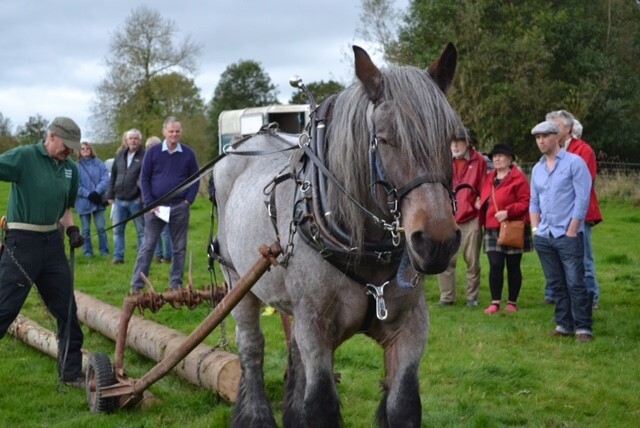 Prince and Pugh of Knighton had set up a wood-burning stove in the middle of the field which looked rather dramatic and I saw two lovely horses at the side of the field which gave rides in a horse drawn cart. Then there was a beautiful coracle (a small ancient boat made from hides) which had been constructed by Peter Faulkner. So these weren’t just the usual kind of stalls you see at other such events. A friend came back glowing from the drumming workshop in the woods saying how she had always wanted to do this but had never had the chance or the courage before. I’d have loved to go to this and on some of the walks – the foraging one in particular – but I couldn’t leave the stall for long enough. 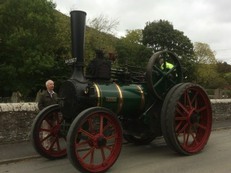 However I had a great view of the steam-roller going up and down the road. For us, we had a successful day. 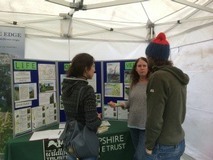 We had plenty of visitors to our stall where we were able to talk to people about the Knucklas Castle land project and our aim to buy the land outright for the benefit of the community. 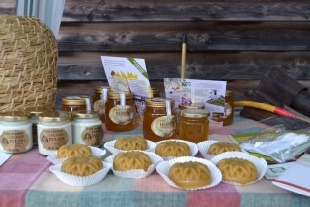 We sold some Knucklas Castle pottery, copies of our book ‘In the Shadow of Knucklas Castle’ and several jars of Knucklas Castle honey made by the bees from the castle’s allotments. 12/5/17 Work has now been completed on the first stage of improvements to the entrance to the Village Hall. A couple of weeks ago, the site was levelled and prepared by a dedicated team of workmen; Sean, Paddy and… no, sorry; I mean Jim, Peter, James and Dave. Tarmac took a little longer to arrive than anticipated, but it has been done this morning just in time for the Big Breakfasts tomorrow (Saturday). No more little annoying bits of gravel scratching the wooden floor. The next stage will be to dress the area with fresh paint on the exterior hall wall, a bench, a plaque to remember Michael Macturk whose donation to the Hall started all this off and perhaps some plants. 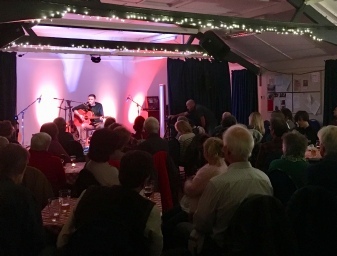 Last night was a sell out and a huge success. We have had so much positive feedback about every aspect of the evening, it is very heartening. 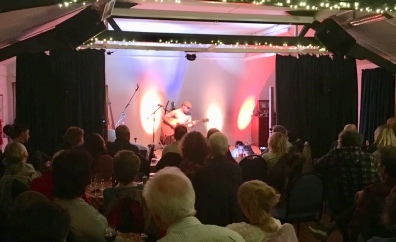 People love our venue and they were stunned by the talent of the musicians last night. It’s great that we are able to put on events like that that are really appreciated. A big thank you to those who helped. 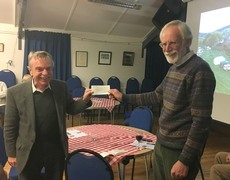 As well as putting on a great evening for the community we have also managed to make £190 for the Village Hall Funds. We have just heard the fantastic news that the Village Hall has been awarded £1765.01 towards the Redlake Valley Hall Outdoor Enhancement Project, part of the Macturk Fund. The money has been raised over the last six months or so by Co-op Members who have voted for Chapel Lawn to receive their contribution. 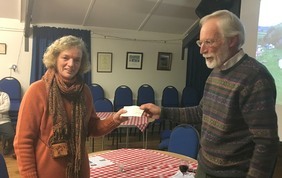 The Society’s Treasurer, Anthony Morgan, is seen here presenting cheques for £806 to Becky Sherman on behalf of the Village Hall and Barry Palmer for the church. The Co-op give 1% of everything their members spend on selected Co-op branded products and services from Co-op Group businesses to a group of nominated community projects.